Everybody is always down on advertising as not to be trusted. There are countless studies that suggest so. That is, until recently. A study released a few weeks ago by Adweek Media/Harris Poll shows that advertising isn't as untrusting as some might say. In fact, it may even be starting to lead in authenticity, with more people trusting advertisements than social media outlets. Those surveyed said they trust that advertising is sometimes honest in its claims (65 percent) and just over one in ten say that they never trust that advertising is honest in its claims (13 percent). Still, advertising has some ground to make up. Among the key differences between those who trust advertising and those who don't is age. 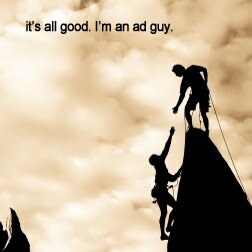 Nine in ten young adults aged 18-34 say they trust that advertising is honest in its claims at least sometimes (90 percent). Conversely, only 81 percent of those ages 55+ agree while one in five ages 55+ say that they never trust that advertising is honest (18 percent). Even more interesting, few people want advertising to be regulated. Forty-eight percent said that advertising doesn't need additional regulation. And 23 percent say that the industry is capable of regulating itself. While interesting, it is not surprising. Government is among the least trusted organizations nowadays. But still, what is changing about advertising? If you want an explanation as to why advertising has suddenly started gaining ground, there are two primary reasons to consider. First, consumers have become exceptionally vigilant in pointing out problem companies that lie to consumers. Any company making false claims today, with the exception of those that need advanced expertise like medical, are brought to light by consumers who don't want to bury those companies as much as they want them to change. And second, which can be tied back the USC Marshall study cited a few days ago, people see brands as extensions of themselves. They want their favorite products, services, and companies to do well. And sometimes, when those companies make mistakes and then are willing to make good on their original promises, consumers are ready to forgive them.